The election period runs for one week and ends next Monday, December 21, at midnight (US EST), so don’t delay in letting your voice be heard! A woman with firm convictions and an unquenchable drive to get things done, Chief Administrator Narala turned the infamously lawless and failed colony of Nimbus III into something its people could be proud of. Once the poster child of a failed planetary society, Nimbus III is now a thriving galactic hotspot. As the leader of an outer ring colony, Chief Administrator Narala promises to promote greater Federation unity and equal representation across the Federation, with a renewed focus on addressing the needs shared by all Federation members and colonies, not just the core worlds. For the past fifteen years as the Chief of Staff for Trill’s government, Excellency Kthria has served as a national unifying figure to conduct negotiations with other powers. In the aftermath of the Dominion War, Excellency Kthria established the Kalandra Reconstruction Authority, an agency which coordinated the flow of materials among various planetary governments at the sector level. In light of recent tensions between the core worlds and the outer Federation over competing resources and attention from the Federation Council, Excellency Kthria proposes setting up sector governments and more sector versus planetary commands, designed to facilitate rapid response and a more cohesive Federation government. A fixture of Federation politics for decades, Councilor Steiner came to prominence in 2373 with his famous “crows” speech delivered on the Federation Council floor, where he passionately declared that “the crows have come home to roost” as the Dominion War broke out. A proponent of an expanded Starfleet, Councilor Steiner also served in the Federation Peace Corps, cultivating a deep appreciation for other cultures. He has repeated time and again that diversity is the Federation’s greatest strength, and that the Federation must not be blind to the ambitions of other powers. A former Starfleet Officer with a background in both the mental and physical sciences with several decorations therein, Ambassador Ventu has handled over thirty first contact situations and her influence as Ambassador-at-Large to the Galactic West is widely felt in the Menthar Corridor, where she had a major hand in the creation and launch of Astrofori One, a new space station that also serves as a center for diplomacy and mutual cooperation between powers as diverse as the Breen Confederacy and Romulan Star Empire. Her platform is built on peace and diplomacy, with Ambassador Ventu calling for understanding and outreach in response to the competing interests of other foreign powers as well as the rise of such threats as piracy and the Maquis Reborn. 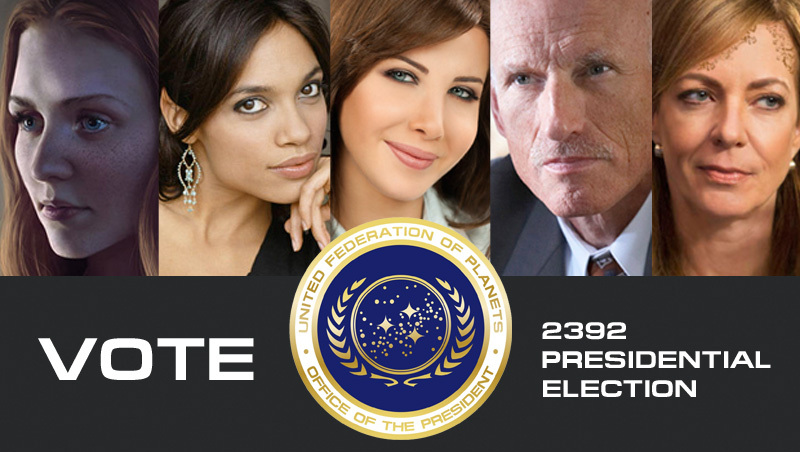 Elected as the youngest governor in Axanar’s history, Governor Vor has pruned Axanar’s government and its institutions of ineffective policies, inept administrators and cut a swath through the bureaucracy for a lean and efficient political machine that has invested in building vast amounts of infrastructure and launched an ambitious program to reform the education system. Governor Vor promises to implement the same platform of multi-culturalism, economic growth and job creation on a wider scale if elected President, calling for the Federation to invest in new technologies, research, and infrastructure, and tap into new ideas and the potential of young minds across the Federation. Now it’s time to cast your ballot! Fill out the form below and hit submit. The election period has ended. Thank you to all who voted! Stay tuned to the Federation News Service for the results!